1 Combine maple syrup, rind, juice, vanilla bean and seeds in a large deep-sided frying pan and bring to the simmer over medium heat. Add pear and cook, turning pear occasionally, until tender, glazed and syrupy (10-12 minutes). Keep warm. 2 Meanwhile, for spiced ricotta, process ingredients in a food processor until smooth and combined. 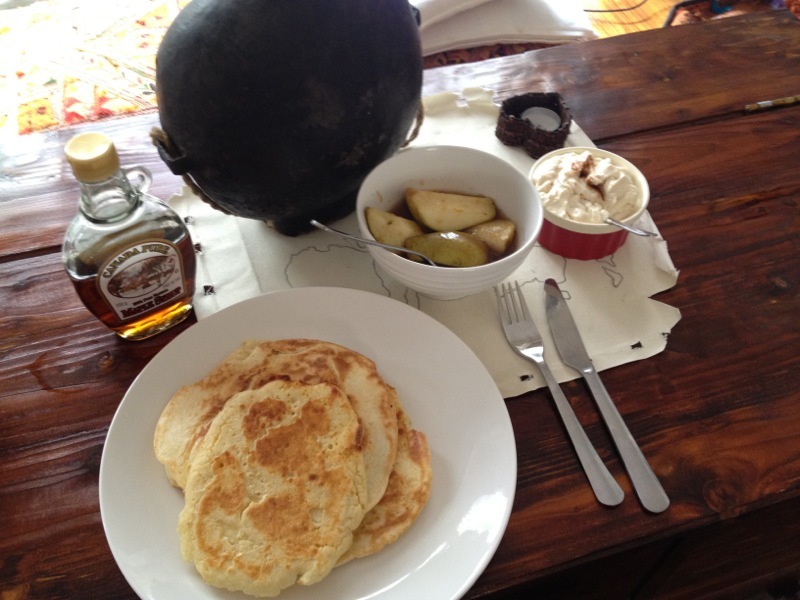 Serve dolloped on top of pancakes with maple-syrup pears. 1 Melt 60gm butter in a small saucepan over low heat, cool slightly, then combine in a large bowl with buttermilk and egg yolks and whisk until smooth. 2 Sift over flour, bicarbonate of soda and 1 tsp fine salt, mix until smooth and combined (do not overwork). 3 Whisk eggwhites and a pinch of salt in a separate large bowl until firm peaks form (2-3 minutes), then fold into flour mixture. 4 Melt 10gm butter in a large heavy-based frying pan over medium heat, add ¼-cupfuls of pancake batter, allowing room for it to spread. Cook until bubbles appear on the surface and edges are golden (1-2 minutes).